I did not, of course, want to sleep with my students. But I did want them to like me. And it would be okay, too, if someday a handful of them loved me in the way that I’d come to love my first creative writing professor. I remember how, as I’d worked my way through my college’s orientation process, students recommended him at every turn. He was fun, they said, interesting, and cared about them as people. Within the first few days of class with him, I knew that this was true. He’d taken time to learn our names, and he encouraged each of us to drop by his office so he could get to know us. I went to see him a week into the semester. Before long I was going to his apartment for dinner and drinks. There’d be other students there, too, and he’d hold us spellbound with his life stories, sometimes revealing something intensely personal, how he’d coped, for instance, when AIDS claimed his partner of twenty-three years. This, it seemed to me, was where our real education took place. And this was how a professor became a human. I’d hoped to model my teaching after him. I planned to infuse my lectures with stories from my life, anecdotes that would be elaborated upon in my den or a nearby bar. But it hadn’t quite worked out that way. My writing professor was single and lived alone, whereas I am married with children. In two years, I’ve only had students to my house twice. I’ve never taken them to a bar. I have had food and drinks with them at The Ninty-Nine, a family restaurant not far from the school. But my cryptic student Jean had joined us there just a few times. And on one occasion, my wife was there, too. I started noticing things after that, the way, for instance, Jean looked at me during my fiction writing class. Whenever I glanced in her direction, she blushed, and while I cannot entirely rule out the power of my imagination, I sometimes saw a wink of an eye or the pucker of lips. It was difficult not to stare at her. I often lost my train of thought. After two weeks of this, she sent me an email, requesting a conference. She wanted, she said, to discuss an idea for a short story. The make-up was new, thickly applied mascara and a pasty–looking foundation; I’d never seen her wear it before, or perhaps just not so much of it. 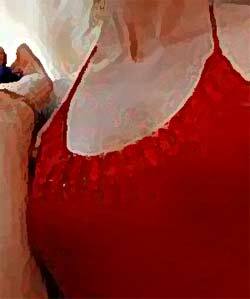 Her red sundress had spaghetti straps, revealed more than a hint of cleavage, and fell to her knees. It was conservative attire by student standards, until she sat in my rocking chair and crossed her long legs, causing her hem to rise to mid-thigh. The smell of perfume rushed to me. She smiled and glanced at the door. “Do you mind if I close that?” she asked. “That happens all the time,” I said. She scratched her ankle again. I drank from a bottle of water on my desk. She crossed her legs, brushing something off her thigh. I turned this comment over and over in my head, trying to make sense of it, but I could not. Clarity. I needed clarity. Her strange, cryptic style simply would not do. Jerald Walker attended the Iowa Writers’ Workshop and is currently an assistant professor of English at Bridgewater State College in Massachusetts. His works have appeared or are forthcoming in The Missouri Review, The Iowa Review, The North American Review, The Chronicle of Higher Education, Outsmart and Best American Essays 2007.